Some people go out of town for the Fourth of July. It’s obvious, however, that those people don’t live in Charleston. The Holy City is the sort of place where people want to spend holidays and vacations, and if you’re lucky enough to be in the area this Independence Day and not stuck at your great-aunt’s country house, head to Tabbuli for a fantastic party on our patio, where every day and every night is a celebration of freedom! 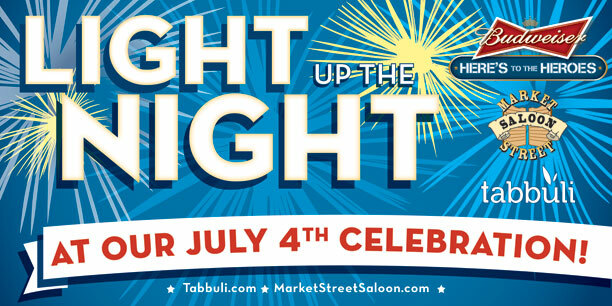 Our theme this year is “Light Up the Night,” and festivities will be in conjunction with the Market Street Saloon, another great Charleston Hospitality Group restaurant. Get your VIP wristband at Tabbuli, starting at 4 p.m., and you’ll receive special access to the Saloon all night! Enjoy food and drink specials on the patio, including our Red, White and Blue Painkillahs, back by popular demand for the festivities! And there is no better place in town than Tabbuli for watching the fireworks at Patriot’s Point, one of the best shows in the Lowcountry. Happy Independence Day from all of us at Tabbuli! ← Cheers for Three Years!